MidAtlantic Engineering provided technical guidance and provided Site Civil designs for the permitting and approval of a new American Legion building where the prior single story building was damaged by Superstorm Sandy. The new facility incorporates meeting and event space, along with supportive residential units dedicated to homeless veterans. MidAtlantic was proud to support the team in this patriotic endeavor. MidAtlantic Engineering was engaged for civil engineering, surveying and permitting services to develop a 5-acre property in Bergen County. The new community will contain 120 units of affordable rental housing for seniors. MidAtlantic Engineering was contracted by DeBartolo Development to provide technical guidance along with Site Civil & permitting services for the approval of two Blocks within the Riverbend mixed-use residential project. The project, totaling 634 units adjacent to the RedBull Stadium, also includes a community park along the Passaic River, designed by MidAtlantic for inclusion within the proposed Redevelopment. In addition, MidAtlantic assisted with obtaining $5M in grant funding for the project. Structured parking is provided both beneath the building and between residential pods. Work is ongoing for the remaining blocks within the Riverbend project area. MidAtlantic Engineering was engaged for civil engineering and permitting services to redesign the former Point Pleasant Hospital project which provided 74 residential apartments within five buildings including both basement and surface parking. MidAtlantic revised the site design to condense the site into four buildings, provide for surface parking, and to increase the size of the amenity and pool area. HIPRA is coming & MidAtlantic is looking forward to helping HIPRA through the development process! MidAtlantic is pleased to welcome Anthony Tedeschi and Stuart Lewis to our team. Anthony and Stuart previously held positions with an international waterfront engineering firm, and are bringing years of experience ranging from design, permitting, dredging, underwater inspection, hydrographic sonar scanning and 3-D underwater imaging. They will add value to our current waterfront engineering services in addition to expanding MidAtlantic’s service offerings by launching an underwater inspection team of engineer-divers. 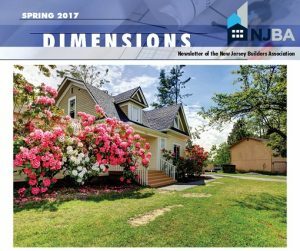 Click on the link below to read MidAtlantic’s article about using drones for land surveying published in the Srping Edition of NJBA’s Dimensions publication. MidAtlantic Engineering Partners is excited to again be attending this year’s Atlantic Builders Convention being held in Atlantic City, New Jersey at the Convention Center and Golden Nugget Casino. The conference, now in its 68th year, will be taking place from April 4-6, and is expected to have over 6,500 attendees. One of MidAtlantic’s Firm Principals and Project Managers, Matthew Robinson, will be in attendance and speaking on a panel about Engineering: Concepts, Strategies and Practices. Matthew’s professional experience has included working with multinational corporations, regional developers and local companies managing a wide variety of projects including one of the regions largest urban redevelopments in Harrison NJ. He also manages teams of engineers to successfully complete major healthcare projects throughout the state, and design of various industrial developments as well as numerous residential projects from single family homes to apartment complexes. He is also presently teaching part-time with The College of New Jersey, School of Engineering as an adjunct professor. The Atlantic Builders convention is hosted by the New Jersey Builders Association and is the largest regional building industry tradeshow in the Northeast. With nearly 400 exhibitors participating in this year’s conference, it is the premier event for residential and commercial builders, developers, remodelers and subcontractors to network with others in the building industry and learn about new products and services. Attendees also have the opportunity attend educational seminars where they will able to learn from their peers and industry experts about the latest market trends, government policies and technical developments. Be sure to catch Matthew’s talk from 12-1:45 on April 5th and stop by our booth # 509 to meet some other members of MidAtlantic’s talented team that will also be in attendance. MidAtlantic engineering was engaged by the Alpert Group, to support the acquisition and rehab of New Hope Village, an existing affordable housing high rise building in Newark, New Jersey. Remediation efforts included underground storage tank removal and installation of long term monitoring wells. Work was performed under the direction of MidAtlantic’s Licensed Site Remediation Professional.